Last year, we remodeled the addition, changing the colors, the floors, counter tops, etc. 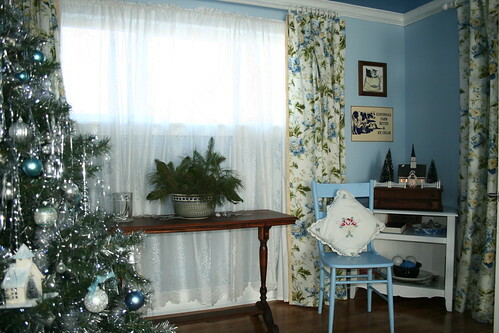 When it came to Christmas decorating, changes had to be made to accommodate that. We bought this house in 1994 and renovated it before moving into the house in 1996. 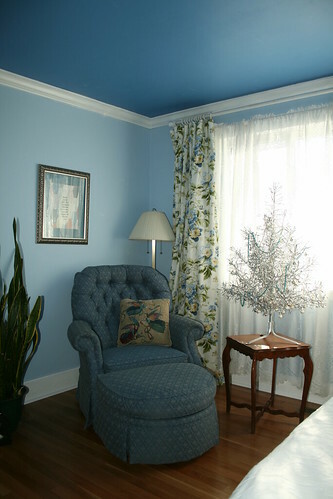 The wallpaper, carpet, and colors were chosen then. So it was overdue for a makeover. 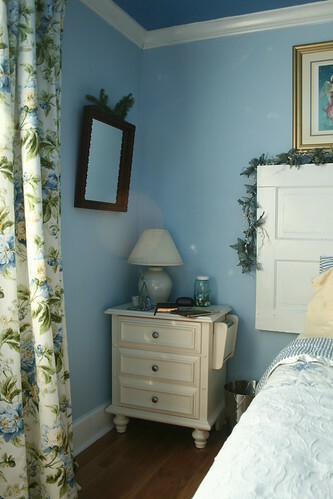 We painted in blues and white, with some cream and yellow accents. 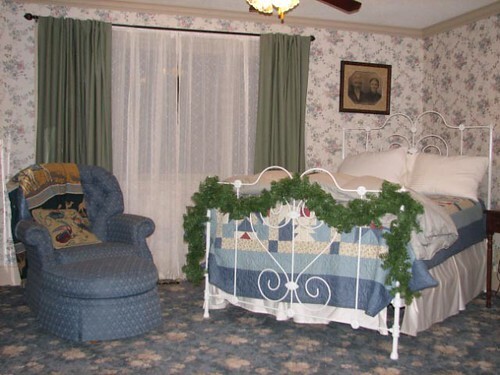 To the right of the bed is a lowboy dresser that used to be in the scrapbook room. Several pieces of furniture played musical chairs during the past few months. 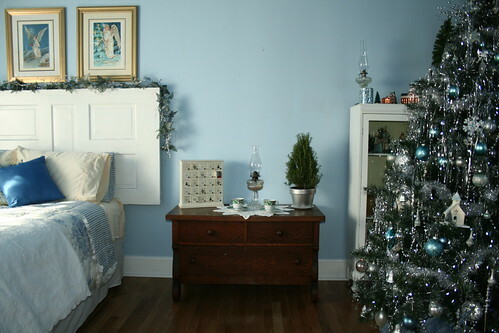 On the top of the little dresser is an Advent box and a rosemary tree. The Advent box came from Target in 2008. They had several styles and colors. This one seemed just right for the guest room. To the right is the bookcase that came from DH’s family. On top the bookcase are lighted buildings that are replicas of the county courthouse and the historic jail house in my home town. The jail is now a county museum. 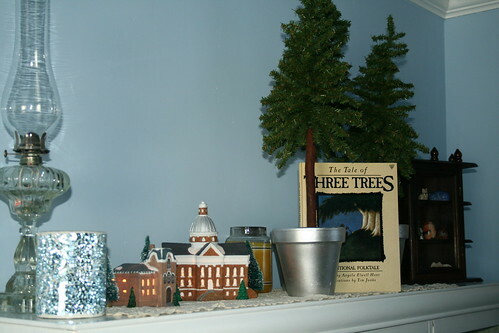 The book “Tale of Three Trees” stands in front of three fir trees in silver flower pots. 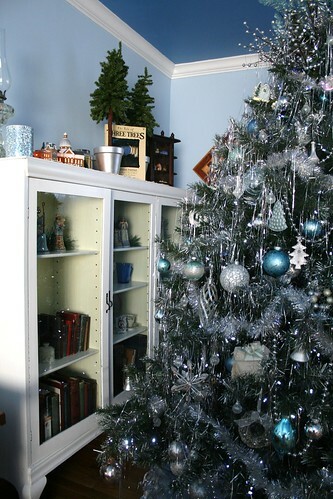 And in front of the bookcase is the Christmas tree. The tree is placed there so it can be seen down the hall as you look into the addition from the music room (formerly the office, before the desk wandered off to the library…now the “music room” because the piano lives there). Turning to the right and facing the north wall, we see the north window, a small table, a vintage chair and a corner cabinet I found on Craig’s List. I still need to put the doors back on the bottom section, but the cabinet fits perfectly in this corner. The cabinet was stained. I sanded and painted it for the guest room. 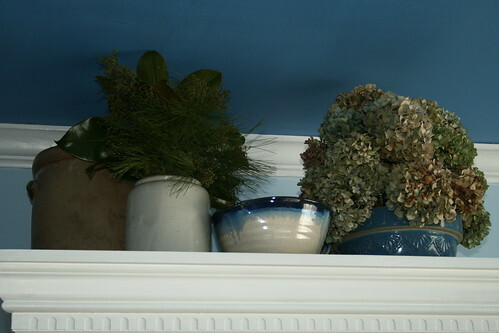 The white glass lightning rod balls on the bottom shelf are from my husband’s family farm and the blue one is from the house my paternal grandparents lived in. My friend Laurie made the drapes. Aren’t they beautiful? 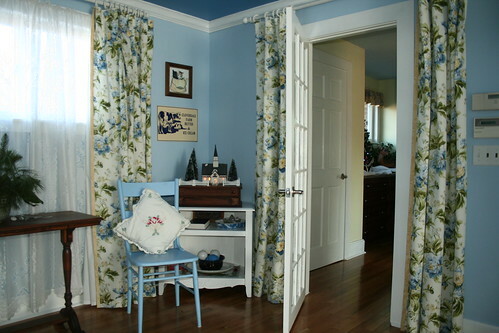 It was her idea to hang them over the door, as well, which preserves the look of the lovely beveled glass but also provides privacy for the guest room when the drapes are pulled over the door. 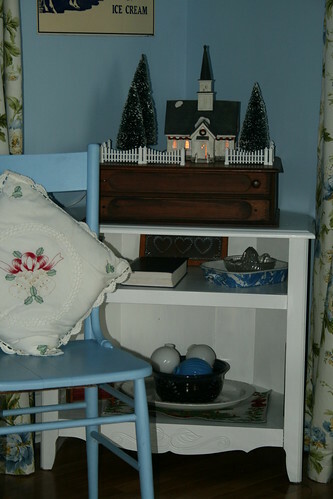 To the right of the door is another vintage chair, painted blue. 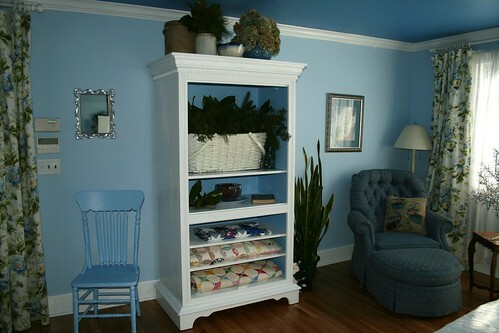 and then the armoire, which you can see in the first picture of this post used to be stained, but is now painted white with a blue interior. 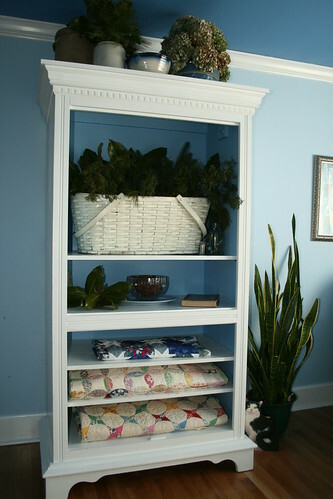 The dried hydrangeas on top the armoire are from our garden. 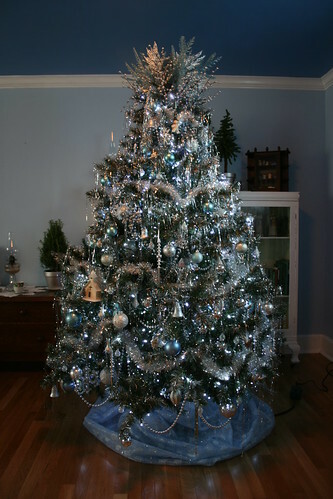 Next is the comfy chair and the aluminum Christmas tree. 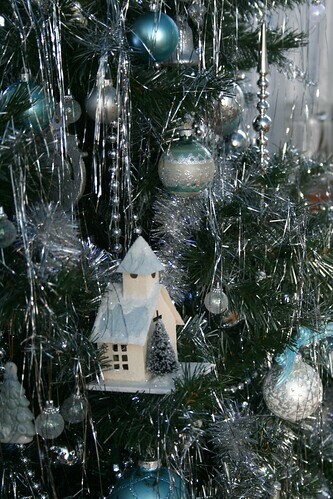 The tree sparkles and shimmers in the sunlight coming through the south window. 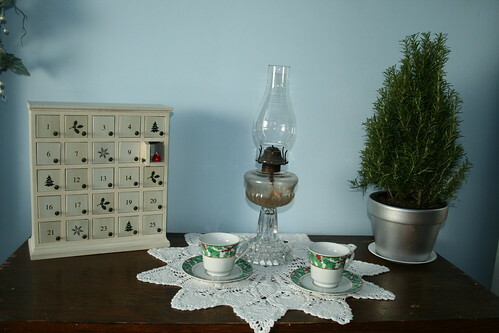 On the other side of the window is a nightstand that had been in the attic. Works well here. That brings us back to the bed. 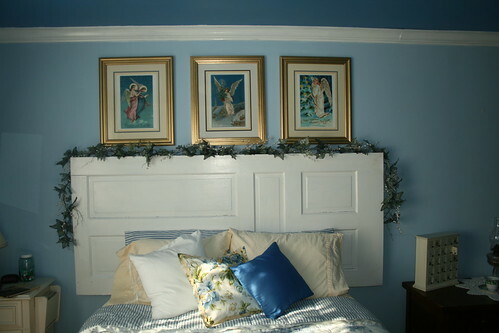 DH made the head board from a door his parents had acquired from their church years ago. 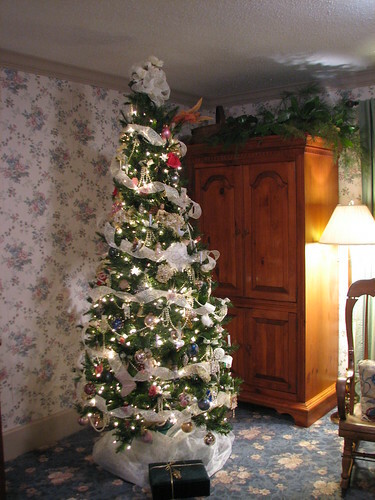 This entry was written by ~~Rhonda, posted on December 12, 2009 at 9:19 pm, filed under Christmas, home and tagged Christmas, guest room. Bookmark the permalink. Follow any comments here with the RSS feed for this post. Post a comment or leave a trackback: Trackback URL. Wow! Can I come, and just absorb the peacefulness of the room. Rhonda, your home is AMAZING! I can’t call it a house… you’ve truly made it a home to be proud of. The flowered carpet was very pretty, but I thought the flowered wallpaper with it made the room too busy. 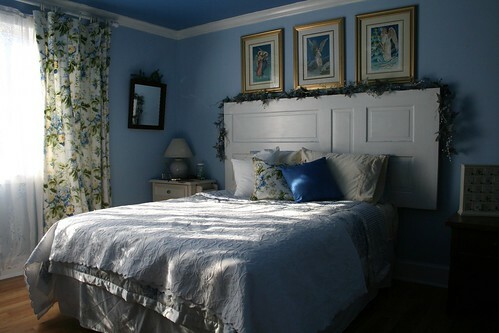 The new look is much cleaner and crisper — hardwood floors, blue walls with white trim, and cream and yellow accents. Very nicely done! Thanks for solving a mystery for me. I recently found a beautiful gold colored wooden box at a thrift store. It has 25 little doors. It did not hit me until today that it might be an advent box. Googling I found your picture and the source-Target.It’s too cute to use only during the season. I was wondering if you took the hinges and door knob off the door. if so did you fill the holes or just leave them.